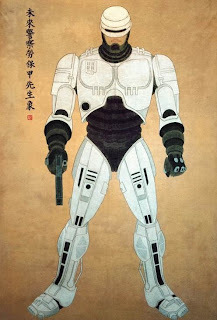 Hankyoreh presents a selection of paintings by Son Dong-hyeon, with contemporary popular culture motives done in traditional Korean style. Besides "Future policeman No Bo-gap" (see picture), there is for example Kwemul Kollûm sônsaeng sang and Uju chônsa Yoda sônsaeng sang among others. For more serious topics in the same vain, painting contemporary motives in traditional ink style, see Hwamado (火魔圖, fire devil picture) paintings by Jung Jae ho. The hwama (火魔) of the paintings are fighter planes.